This is what happens when you let your daughter have her own magnetic calendar and you make some cute little saint of the day magnets for her and she comes to you and says that today is St. Ambrose's feast day and do you remember what we did last year for St. Ambrose's feast day? Uh... you do realize that Mommy has slept at least 365 times since that day and that was before I had a blog to help me remember chronicle our days. BUMBLEBEE COOKIES! That's right! To celebrate the patron saint of beekeepers we kept these bees in our tummies! 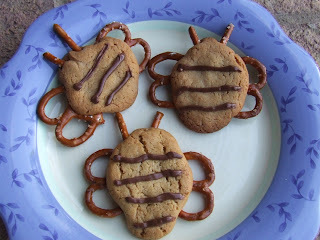 Use your favorite peanut butter cookie dough, some pretzels and melted chocolate for the stripes. We rolled the dough into balls and flattened them on top of the mini pretzel twist wings then added the antenna and baked them for about 10 minutes. Once they cool, you can pipe the stripes on using the corner of a ziploc bag. My table is covered in flour, but my kids are happy! Now it is off to movie night with my girls. Little Women is playing and I'm going to make some tea. Good night! P.S. I fixed the link below. What a cute idea!! I'll have to remember it for next year! Do you add the pretzels before or after baking?? We rolled the dough into balls, positioned them on the pretzel twists and then flattened them with the bottom of a glass. We stuck the thin pretzels in for the antennas and then baked them for about 10 minutes. If I had remembered them in time, I would have posted before today. Ah! We could have had these instead of the salad!! Next year! Those are so cute! We will definitely have to make those next year... My kiddos were peaking over my shoulder earlier at the photo, and I sure they won't let me forget! Oh! And that is so cute about the calendar. I'm glad you were able to make it! God Bless! Oh I love it, and I love bumblebees!